One of my favorite small wonders of Lawrence is the architectural model of the University of Kansas campus, currently located on the 3rd Floor of the Kansas Union. My kids love it as much as I do, so we worried when it disappeared earlier this year. Much to our relief, it reappeared a few months later with a much needed update. Gone now is McCollum Hall, of course, but there are a bunch of new buildings, including the new Burge Union, Engineering and Business School buildings, and the Oread Hotel. The model was a gift from the class of 1962, and every time I visited KU as a kid, my sister and I fogged up its glass case gazing down at the tiny Campanile, Fraser Hall, and Chi O Fountain within. What strange magic is at work when we view a miniature version of our own world? Filmmakers this year have captured it with super realistic dollhouses and tiny cities taking center stage in some excellent works of suspense. The creepiest has to be Hereditary, in which Toni Collette stars as a sculptor whose work consists of tiny, highly detailed depictions of her life. Collette's character may be losing her grip on reality as she works through, in miniature, the recent death of her mother, and sinister forces gradually reveal themselves in her home. The film is one of the most atmospheric I've seen in years, and one of its best tricks is how it plays with the viewer's inability to tell the difference between Collette’s realistic miniature scenes and the beautifully designed, matching sets in which the actors appear. The Miniaturist, a three-part Masterpiece Theatre adaptation of Jessie Burton's 2014 novel, uses the same illusion in a late 17th Century Amsterdam home where the placement of miniatures within a smaller version of the house seems to influence the lives of its inhabitants. Household secrets discovered by a young Dutch bride are known by the Miniaturist, an anonymous craftsman who sends unsolicited packages containing objects for the dollhouse which foretell future events and offer cryptic advice to its matron. This Gothic tale puts on no literary airs, but does du Maurier and Hitchcock proud. ...As does HBO’s adaptation of Sharp Objects, based on Gillian Flynn’s first novel (her third was the gazillion-copy selling Gone Girl). Here Amy Adams stars as a world weary investigative journalist, Camille Preaker, assigned to cover a pair of unsolved serial killings in her old home town, Wind Gap, Missouri. Aided by a detective from Kansas City, Preaker unpacks all the family weird that fits into a Victorian mansion—the one in which she grew up, as it turns out. Her spooky mom still lives there with her little sister, who obsesses over an exact miniature replica of the house. Any more detail would require spoiler alerts. Mysteries of a gentler sort drive Todd Haynes’ Wonderstruck, based on the children’s novel by Caldecott Medalist Brian Selznick, in which the paths of two characters from different time periods—the 1920s and 1970s—strangely intersect in New York City. In alternating scenes, Rose, a deaf girl in 1920s Hoboken, New Jersey, escapes her domineering father and heads for the American Museum of Natural History, arriving just as Ben, a Michigan boy of the 1970s, makes his own way to Manhattan after losing his mother in a car accident. One of the more quietly powerful and sophisticated films made recently for kids, Wonderstruck builds suspense and pays off with big reveals. The best one comes in a stunning tale-told-in-miniature, shot on location within the largest architectural model ever built, the Panorama of the City of New York at the Queens Museum, a scale replica of the city (1 inch to 100 feet), including 895,000 tiny buildings created for the 1964 World’s Fair. It seems no one is safe from uncanny miniatures this year. Over the summer, my own house fell prey to a Gothic horror of sorts, when my cousin passed along a dollhouse, made by our grandfather four decades ago, to my 5-year old daughter. 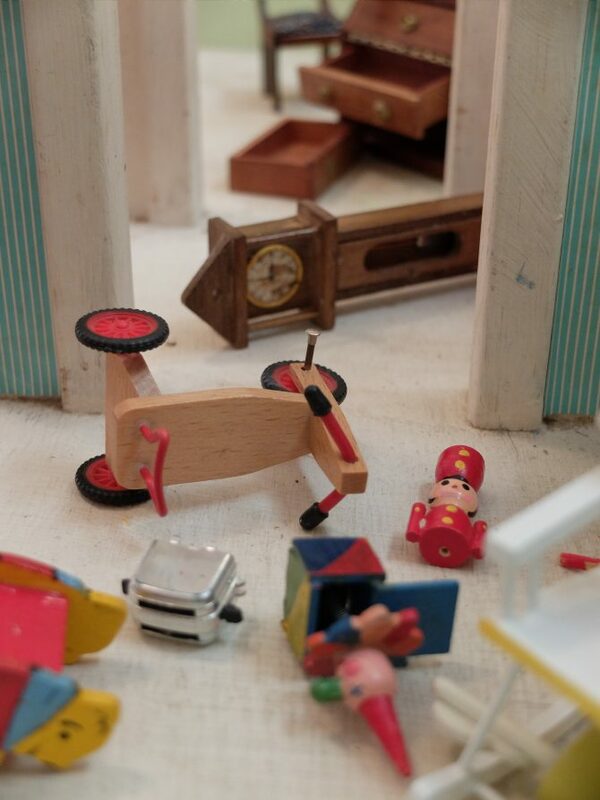 A sense of unease overtook us as we opened the large box of dollhouse furniture and people that came along with it, and terror struck later that night, when, stumbling through my daughter's room in the dark, I stepped on a miniature wooden dining room table and smashed it to splinters. I experienced this eerie phenomenon again early the next morning, then later on that same morning, then again early that afternoon. It occurs almost every time an adult has to walk through her room, come to think of it. But the biggest horror was yet to come. I was shocked one morning as I peered through one of the dollhouse's carefully crafted windows, only to find that our real house now exactly resembled the miniature world my daughter had created in there! Grandpa must have dabbled in black magic when he built this cursed thing, for such a godawful mess as now reigns in both versions of my house—actual size and tiny—could only be the product of supernatural forces.